I was reading a friend’s blog today, Lori Lara on Allowing Our Kids to Question Their Faith when she said something that stirred my spirit. Job had his life restored. You know, sometimes I rant out loud and argue with God. I have been doing that for the last few days. And other times I sit in silence and rant on the inside. There are days I feel like I am screaming on the inside. I used to bury all those feelings and be afraid to express anything. Not a healthy way to live that’s for sure. It made me sick for many years, all that bottling things up. That has changed, thank you Lord. I’m ok having feelings today. And I can talk to God about how I feel without feeling like I am condemned. I rant, I argue, I cry. And then we talk. I have to admit, sometimes I just do not know why God does what he does, and why He allows things that I don’t understand. I don’t have all the answers. I don’t even know all the questions. Why do I try and figure God out? Like He is a normal person or something. Sometimes I am so familiar, or so I think, with God that I put Him in a box and expect him to do what I think. Guess I have control issues. I know I have trust issues. Just being honest. But you know what – I’m not God. I don’t have everything figured out. Sometimes I really don’t know what to do. Sometimes I think I just need to let go and let Him be God. Not like I have any say in it, I mean really – he is God all by Himself. I can’t believe I have been so selfish. Forgive me Lord. Today, I’ll stop trying to tell you what to do and how to do it. Today, I choose to trust You. Posted in Healing, Spirituality and tagged arguing with God, christianity, faith, God, Hope, Inspiration, Life, rant, Religion and Spirituality, Spirituality, trust, trust god. Bookmark the permalink. What really makes the difference is our willingness to rise above our struggles in order to trust God no matter how bad they are. Life’s problems are inevitable, and our struggles do not take God by surprise. Which means that there is a reason why He allows them to come into our lives, but what we should do is to develop an attitude of praising Him in midst of life’s storms because that is the greatest expression of our faith. 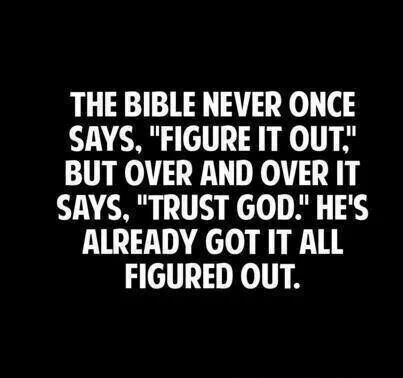 Just trust him! Always remember that god give his hardest battle to his strongest soldier.